Hiya guys! It's been such a long week, I had to take a few days away from blogging to take care of... well everyone including my dogs. This has a week of ER visits, groomer mishaps, and stress galore. I'm still trying to recover from it all, but you know what helps all this stress? The fact that I'm going to Polish Con this weekend!! It'll be my first time going to any convention so I'm really nervous and excited. Just focusing on all the polish makes the anxiety so #worthit, haha. 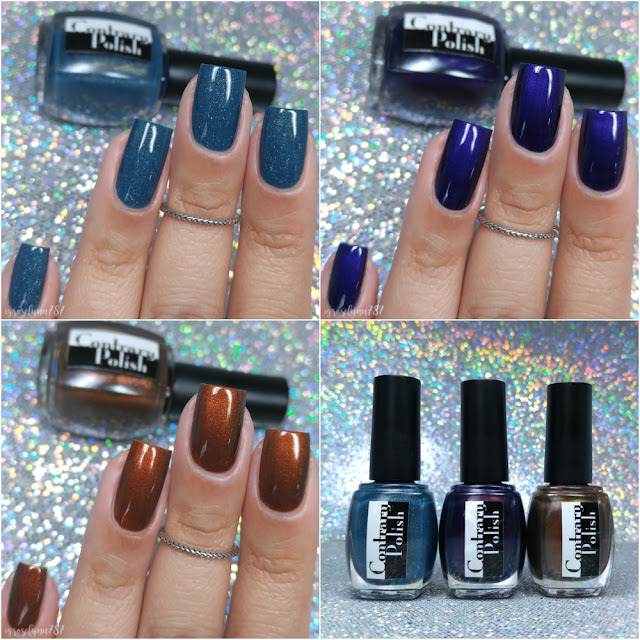 Speaking of, today I'm sharing swatches for the limited edition Polish Con NYC Trio from Contrary Polish. The trio is inspired by and named after phrases from The New Colossus, the poem written for and mounted on the base of the Statue of Liberty. The Polish Con NYC Trio by Contrary Polish will be available at the event this Saturday, April 29th. There will be a limited online release the following week after Polish Con for all those that aren't able to attend. Yearning to Breathe Free can be described as a blue based crelly (slightly greyed/slightly green) with fine gold shimmer and five sizes of holo elements, which includes fine linear pigment and micro flakes. In the macro you can see the color lean more towards the grey and green side. The formula has a sheer application, but it builds up really quickly to an opaque finish. It has a really smooth and nice consistency, very easy to work with. It dries down to a smooth finish and there is no staining on removal. Shown in two coats and sealed with a glossy topcoat. Sunset Gates can be described as a dark blurple base with strong color-shifting shimmer in the sunset color range. I wish I could have captured the shimmer shift in this shade, but it was very subtle to the eye even in person. That said, I adore how rich and deep the color is. It has an almost metallic feel to it, don't you think?! The formula has a opaque application, although it's not quite a one coater. It has a really nice consistency, not too thick or too thin. And despite it's pigmentation, I didn't experience any staining to my nails or cuticles. Shown in two coats and sealed with a glossy topcoat. Mother of Exiles can be described as a metallic multichrome shifting from copper to gold to green. The gorgeous shade is inspired by the original copper color of the Statue of Liberty, before it oxidized to the green color we see today. Hands down my favorite from the trio, my photos don't do the shimmer shift any justice.It's a very unique shade and compliments my skin tone so well. The formula has a sheer application, but builds up nicely for great coverage. So much shimmer and there are barely any visible brush strokes. The consistency leans on the thin side, but it's manageable and doesn't tend to run. Shown in three thin coats and sealed with a glossy topcoat. To recap, Polish Con NYC Trio by Contrary Polish will be available at the event this Saturday, April 29th. There will be a limited online release the following week after Polish Con for all those that aren't able to attend. Each of these polishes are just stunning! Stunning swatches of these three!